Finally, Sunny Deol and Preity Zinta starrer Bhaiaji Superhit gets a release date after a long delay of five years! 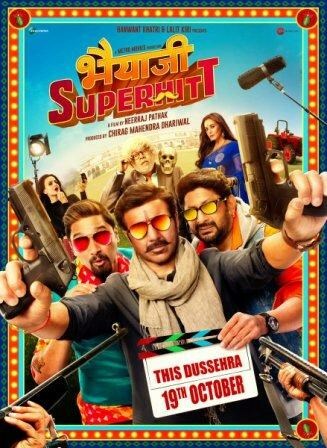 Sunny Deol took to his social media profile to reveal the release date and the first look of Bhaiaji Superhit that also stars Preity Zinta, Arshad Warsi, Shreyas Talpade, Ameesha Patel, Sanjay Mishra, Brijendra Kala, Jaydeep Alahwat, Mukul Dev, Pankaj Tripathi and Pankaj Jha. Bhaiaji Superhit, starring Sunny Deol in a double role, will hit the silver screen on 10th October. Directed by Neeraj Pathak and produced by Metro Movies, the film is a hilarious laugh riot film based on a gangster who wants to become an actor. This will be Preity Zinta’s comeback film as she shot for the movie right after her marriage. She will be seen on screen after 5 years with this film. Apart from Bhaiaji Superhit, Sunny Deol is also coming out with Yamla Pagla Deewana Phir Se, which is an action comedy film, directed by Navaniat Singh. It is a sequel to the 2013 film, Yamla Pagla Deewana 2 and the third installment of Yamla Pagla Deewana film series. The film also stars Dharmendra, Bobby Deol and Kriti Kharbanda in lead roles and is scheduled to have its theatrical release on 31 August 2018.